LONDON – Nearly four years after the World Health Organization was accused of bungling its response to the biggest Ebola outbreak in history, the U.N. agency appears to be moving swiftly to contain a flare-up in Congo, in what some experts see as a critical test of its credibility. “The difference between WHO’s response in 2014 and now is like night and day,” said Suerie Moon, of the Graduate Institute of International and Development Studies in Switzerland, who was part of an independent panel that assessed WHO’s performance back then. Fourteen cases of Ebola have been confirmed in Congo since the outbreak was reported last week, including one death. More than 40 suspected or probable cases – including 25 deaths – are under investigation. Health officials are trying to track down more than 500 people who have been in contact with those feared infected, a task that became more urgent this week with news that the deadly virus had spread to Mbandaka, a city of more than 1 million. WHO’s chief flew to the outbreak’s epicenter last week, dozens of staffers have been sent to the country, and thousands of doses of an experimental vaccine have arrived, with more on the way. On Friday – 10 days after WHO announced the outbreak – the agency’s expert group convened to decide whether to declare the crisis an international emergency. It decided the situation does not yet merit such a declaration. “I think there is a clear connection between the heavy criticism WHO received in 2014 and the current response, where they look to be reacting very quickly,” Moon said. In March 2014, WHO announced the discovery of Ebola in West Africa’s Guinea by posting a two-sentence update on its website. Over the next few months, the number of victims spiked, cases spilled across borders and international aid workers became infected. Despite calls to declare the raging epidemic a global emergency, WHO resisted: Not until 1,000 people had died did it convene its expert committee to even consider the possibility. Ultimately, more than 11,000 people died in West Africa. WHO’s sluggish response was widely criticized and resulted in an overhaul of its emergencies department, among other attempted fixes. An Associated Press investigation found the health agency delayed declaring the outbreak to be a global emergency for months, partly out of fear such an announcement would anger the African countries involved or hurt their economies. 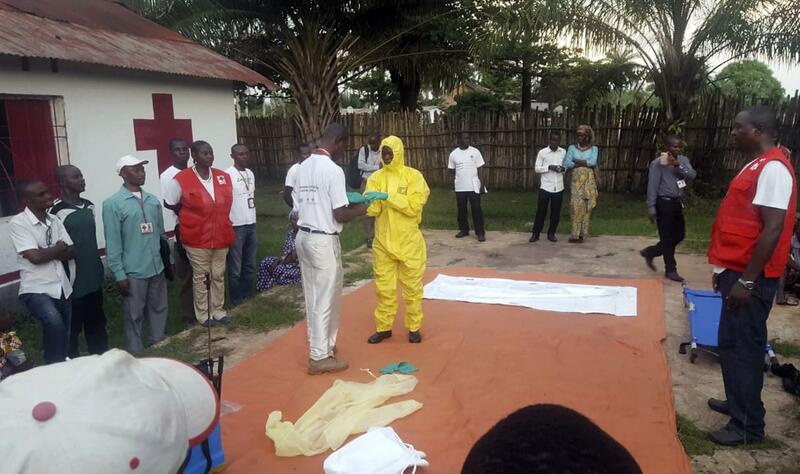 The AP also found WHO’s response to be inadequate and chaotic, with organizers relying on expired chlorine, experts arguing over the color of body bags, and poor coordination that resulted in an Ebola clinic being built only after the epidemic had peaked. This time, the fact that WHO’s director-general, Tedros Adhanom Ghebreysus, met with political leaders in Africa last week shows a heightened awareness of the seriousness of the crisis, Moon said. Tedros, who goes by his first name, was elected last year, succeeding China’s Dr. Margaret Chan, who was in charge during the West African outbreak. Still, others pointed out that the West Africa Ebola outbreak isn’t entirely comparable to the current situation in the Congo. When the lethal hemorrhagic fever broke out in Guinea, it was in a region with porous borders that had no experience with the disease. In comparison, Congo has had more Ebola outbreaks than any other country in the world, and although the virus made it to a big city this week, most of the cases appear to be in a remote area accessible largely by dirt roads. Jha said it is too early to tell if WHO’s response has been a success. “There’s been a lot of excitement about how great WHO is doing, but I think the celebrations should wait until we can see how this outbreak is really unfolding,” Jha said. There have been rumors that Ebola cases went undetected for months before WHO’s announcement, which could mean the virus has had much longer to spread. That could reduce the chances of bringing a quick end to the outbreak. Dr. Jeremy Farrar, director of the Wellcome Trust, a British charity, applauded WHO’s director-general for putting epidemics and health security high on his agenda. Moon said it is too early to be optimistic and warned that the world will be watching the organization very carefully. Published: May 18, 2018, 4:37 p.m.